This review is of the show's run in 2013. 'The Bunker Trilogy' returns in September 2015. 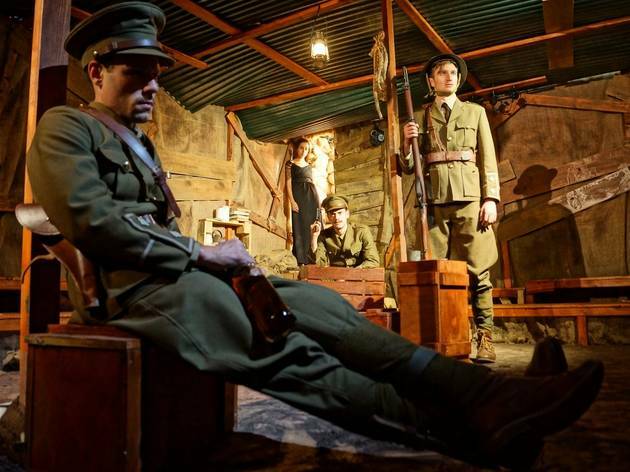 It's an interesting premise, if a little arbitrary and a smidgen restrictive: stage three very different plays adapted from drama from wildly varied eras in a replica of a tiny bunker in a trench in world war one. The best by far is 'Morgana', worked from the Arthurian legends by James Wilkes (who has also adapted 'Agamemnon'). To find a way into the story, he has three soldiers as old boarding school chums who, along with 10 other, now dead peers, gave themselves pet names. These three are Arthur, Lancelot and Gawain. There's a plausible mystery and magic in this show, evoked in the way the innocent Gawain (played by James Marlowe with a touching vulnerable innocence) meets an intriguing French stranger in the local town and how his traumatised mind gives way to strange, bewitching hallucinations. All the while the otherworldly Serena Manteghi as Morgana, Guinevere and Gawain's love interest permeates the three men's memories and thoughts, until their sharp, funny boyish banter slowly gives way to distraction and dread. 'Agamemnon', on the other hand, just about works. Here we meet a wounded soldier and his unwitting companion, trapped in the bunker with only rum for comfort. The story of the bleeding Agamemnon's betrayal of his young wife emerges through flashbacks. 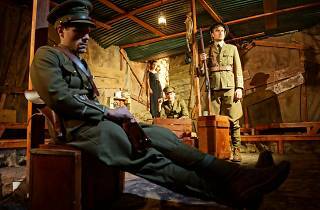 The world war one conceit feels flimsier than in the other play but is just about carried off - it is a war, after all. The companion character - called only 'Soldier' - is weak, however, and is crowbarred into the script for no good reason. The jumping back and forth in time and place also gets very confusing and seems at odds with the decision to use the hyper-real set.